The Tampa Bay Rays are quickly falling out of contention in the playoff race, and injuries to the team’s starting rotation are largely to blame. The latest victim to go to the DL is rookie Jacob Faria. The Rays placed Faria on the 10-day DL Sunday due to an abdominal strain. The Rays don’t believe the abdominal strain will be a long-term injury for Faria. But at the moment, there’s no timeline for his return. The 24-year old Faria is in the midst of an impressive rookie season. In 13 starts, he’s 5-4 with a 3.32 ERA. However, Faria has had some ups and downs over the past month, and the abdominal strain may be the reason why. The young righty says he’s been dealing with pain in his abdomen for the last several starts. Faria has allowed at least three runs in five of his last six outings. He did so just twice in his first seven starts of the season. “Jake, the success he’s had as a young pitcher, we need to be careful with him and see if we can get this cleared up with the 10 days or whatever it takes,” says Rays manager Kevin Cash. The injury to Faria means that the Rays now have three starting pitchers on the DL, with Faria joining Alex Cobb and Matt Andriese. Cobb was lost earlier this month due to turf toe, while Andriese has missed more than two months because of a hip injury. Jake Odorizzi also had a stint on the DL with a back injury during that time. Amidst those injuries and the instability they have created in Tampa’s rotation, the Rays have fallen further behind in both the AL East and wild card standings. Despite making multiple trades over the past month to improve their roster, the Rays have won just three of their last 15 games heading into Sunday. As a result, Tampa’s hopes of winning the AL East are all but dead. More importantly, there are now six teams between the Rays and the second wild card spot. The Rays have been largely reliant on their starting rotation to carry them this season. But with the injuries piling up all summer, they’ve struggled to maintain consistency in their rotation, and it’s led to an extended team-wide slump in August. There is still plenty of time left in the season for the Rays to get back on track and earn a playoff spot. 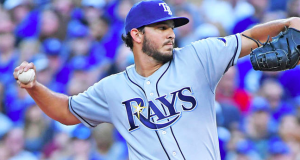 But a healthy rotation is critical to making that happen, and so the injury to Faria is yet another step backward for the Rays. If there’s a silver lining it’s that Cobb appears ready to rejoin the rotation. He’s expected to be activated from the DL and start on Thursday when the Rays close out a series against the Blue Jays. However, getting Cobb back as they lose Faria is a move sideways for the Rays and not a step forward. Until they can get all of their starters back from the DL at the same time, it’s tough to envision the Rays being able to climb back to the top of the wild card standings. If healthy, Tampa’s rotation is more than capable of taking them to the postseason. But time is running out, and the loss of Faria for the foreseeable future is yet another setback for Tampa’s playoff hopes.